Capture attention with colour. Make your most important messages standout. 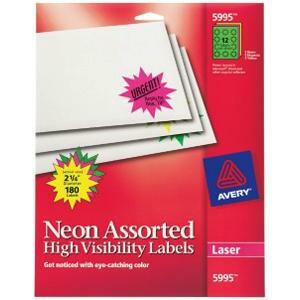 Burst Neon Labels are ideal for priority messages, addressing, colour-coding, identification/warning labels and more. Permanent adhesive. Avery offers many easy-to-use templates for Microsoft Word and other popular software programmes. Includes five each of magenta, green and yellow.